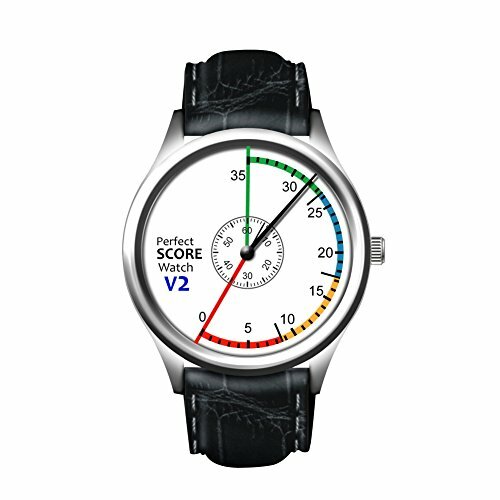 Version 2 Updated Now Available with New Hyper-Accurate Internal Time Movement: The Perfect Score Watch has been trusted by thousands of Pre-Law students to improve their LSAT performance. The value proposition is simple: If using this watch would result in another 1-2 points on the LSAT, is it worth it? We believe the answer is a resounding yes and the Perfect Score Watch makes that possible. The Perfect Score watch is an analog wristwatch designed specifically for the LSAT by a team of Top Law School Graduates who took the LSAT and saw a need for better time management on test day. The Perfect Score Watch enables test takers to manage their time and maximize their score potential, helping students get to those extra few questions which can make all the difference in today's highly competitive admissions environment. Cost Effective: Chances are you have spent hundreds, if not thousands, of dollars on preparing for the LSAT - - classes, tutoring, practice tests, online or in-person courses. Most students neglect focusing on the pace and timing for the test, which is one of the most important pieces of maximizing your potential LSAT score. LSAT Specific Timing: The LSAT is comprised of five 35 minute sections. The Perfect Score Watch allows the test taker to ensure they are on pace for each section. The 35 minutes is broken down into four different colors that represent the four logic games / reading comprehension passages so that test takers know exactly what game/passage they should be working on during the test and do not lose track of time within any given section. LSAC Compliant: The Perfect Score watch meets all LSAC requirements for test day and is ideal for both practicing for and taking the LSAT for real. This watch is custom designed for the LSAT and is entirely analog with no digital component.